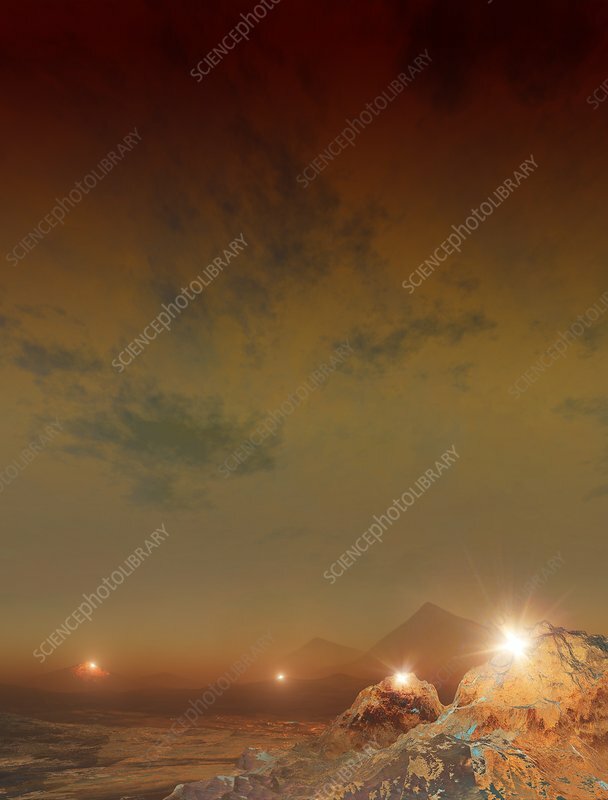 Artwork of exoplanet 55 Cancri e. 55 Cancri is a binary star system located 41 light-years away, made up of a sun-like (G-type) star and a much smaller and dimmer red dwarf. The two stars are extremely widely separated, however, with around 1000 AU between then. There are several planets here, but the one featured in this picture is 55 Cnc e. Announced to the world in 2004, 55 Cnc is a 'super-earth', a terrestrial exoplanet weighing in at around 8.3 Earth masses. It is possible that this odd world is carbon rich, with much of its content being made up of diamonds owing to the high pressures and temperatures in the planet's interior.